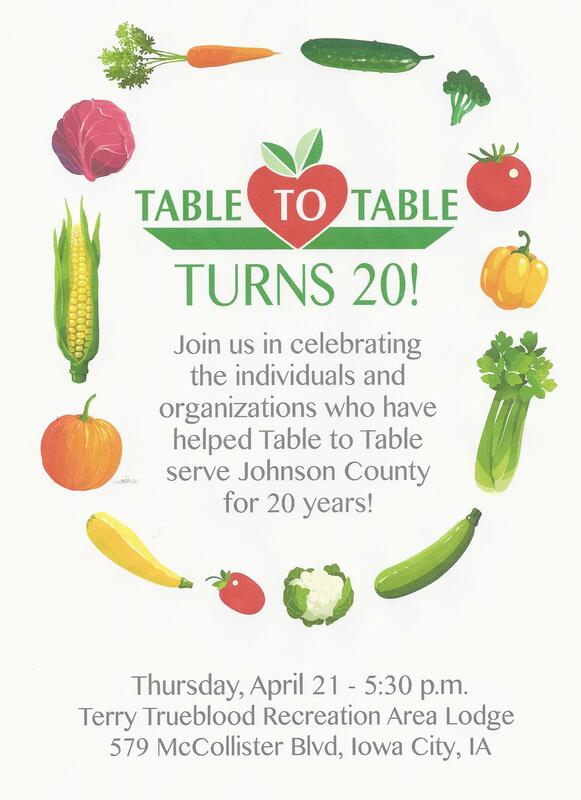 Table to Table turns 20! Tickets are $75 per person or gather a group of 8 for $500 and save! Our Annual Report for FY15 is now available. Please feel free to share it with your friends. 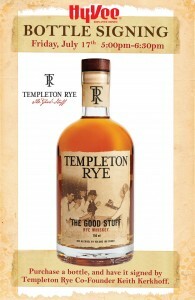 You can enjoy an evening out and help T2T at the same time! Ride Restaurant 630 Iowa Avenue Iowa City will donate 15% of sales from 5-9pm on Sunday July 19th. Order off of their regular menu or choose to enjoy a chicken dinner served family style. On July 29th, it’s Community night at Shorts Burgers East Side 521 Westbury Drive on the east side of Iowa City. They will donate 15% of their sales to T2T. On the last Sunday of each month, Pho Zaika Vietnamese Restaurant 2020 8th Street in Coralville donates half of their of the day’s proceeds to support T2T. 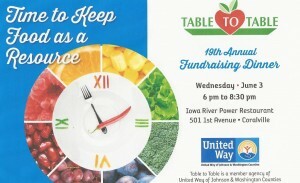 Come on out to the First Avenue HyVee Store for the KCJJ Radiothon to benefit Table to Table. Starting bright and early at 5 am Friday July 17 and running through noon on the 18th. Please stop by and show your support for Iowa’s original food rescue organization! 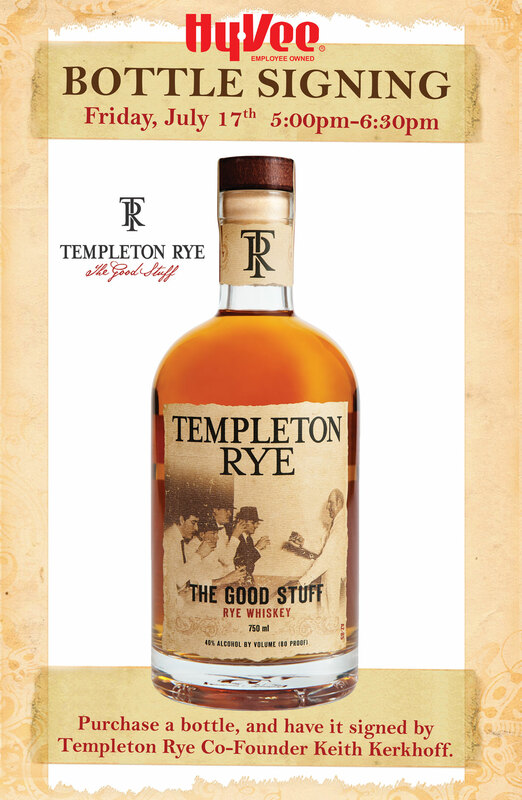 Buy a chance to win a full size whiskey barrel from Templeton Rye (sorry, it is empty) Also, from 5-6:30 pm on Friday evening, Templeton Co-Founder Keith Kerkhoff will be signing each bottle of Templeton Rye purchased. We want to thank Danise Petsel and everyone at Iowa River Power Restaurant for hosting a wonderful evening for our 19th Annual Table to Table Fundraising Dinner! We also wish to thank all of the area restaurants and chefs who provided a delicious array of food for the crowd to enjoy. We received so many requests for Chef Ron Hall’s Triple Ruby Relish recipe that he has generously offered to share it with us! In a large bowl combine the strawberries, radishes, and watermelon. Add the balsamic vinegar, let stand for 10 minutes. Drain. Toss with the mint. 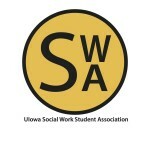 We would like express our sincere thanks to Givanni’s, the UIowa Social Work Student Association and Etre Restaurant Group for a successful dinner to benefit Table to Table. And, a very special thanks to George Etre and Jason Alt for making this event possible. We also wish to thank all of the diners who came out and enjoyed a wonderful three course dinner while supporting Iowa’s original food rescue organization. Table to Table wishes to thank Jonathan Sabin and everyone at Vortex Business Solutions for redesigning our website. Through their SEVA Project, Table to Table was selected to receive a professional web makeover. All work was generously donated by Vortex. The staff did an outstanding job and we are very excited with the results! We couldn’t do what we do without the support of the community and we are truly grateful for all Vortex has done to make this a wonderful website.